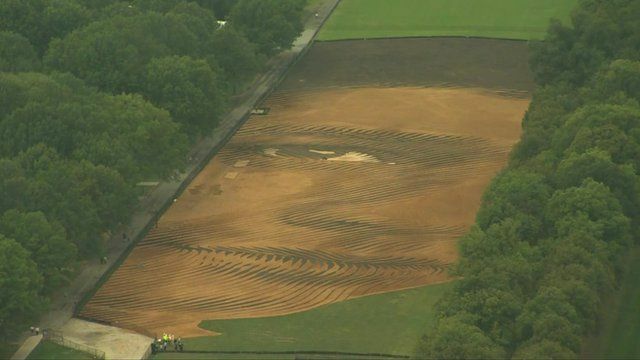 The face you can see from space Jump to media player Visitors to Washington over the next few weeks will have the chance to see a new addition to the National Mall. But it's not a monument or another museum, it's a giant portrait constructed from different coloured earth and sand. 'Chicken from hell' dino discovered Jump to media player Scientists in the US announce the discovery of a new species of dinosaur. The fossils offer further clues to how the dinosaurs became extinct 66 million years ago. US bird populations 'declining' Jump to media player A new report shows bird populations are declining in the US and 230 species are now on a watch list. Jane O'Brien reports. Alec Baldwin and killer medieval yogis Jump to media player The BBC's Jane O'Brien reports on the world's first exhibition exploring the visual art of yoga. Visitors to Washington over the next few weeks will have the chance to see a new addition to the National Mall. But it's not a monument or another museum, it's a giant portrait constructed from different coloured earth and sand. The portrait is a composite of thousands of tourists who visit Washington DC, and is so big it can be viewed from space. It was commissioned by the National Portrait Gallery and created by international artist Jorge Rodriguez Gerada who has done similar projects in Belfast and Barcelona. Jane O'Brien visited the exhibition, which opens to the public on 4 October.